What are the Best TMJ Pillows to Help You Sleep Better? Early in my marriage, I thought I knew everything there was to know about my wife. However, a few nights after we moved in together, I noticed something unusual in the middle of the night. It was around 2 a.m. and I woke up to the sound of someone chewing gravel. Bewildered, I thought I was dreaming until I finally found the source of the peculiar sound: my wife. Turns out she is suffering from temporomandibular joint (TMJ) syndrome, a condition that causes pain in your jaw joint and in the muscles that control jaw movement. Some people who have jaw pain also tend to clench or grind their teeth (bruxism), which is the case with my wife. A condition that causes pain in the jaw joint. People who suffer from this tend to grind their teeth, making them sound like they’re chewing gravel. Concerned, I did research on the aforementioned disorder and then, we went to see a number of doctors that dealt with this kind of health issue. Several dentists laid out extensive, painful and expensive medical procedures but one specific doctor’s advice caught our attention right away. He mentioned that the conditioned could be definitely resolved if she changed his pillow. Teeth grinding and TMJ can be relieved with the use of TMJ pillows that have the appropriate smart technology pillows, which allow you to minimize the pressure on your jaw. In addition, these also make sure your head and neck is always in the right position, therefore avoiding the involuntary movements known as bruxism. Although exact figures are vague at the moment, the National Institute of Dental and Craniofacial Research has estimated that over 10 million Americans are affected by TMJ disorder with the condition appearing to be more common in women than men. With that in mind, we though it best to share crucial parts of the personal research that I conducted as well as information we gathered from the doctors we consulted in this nifty guide that you can use. Most importantly, we have made several recommendations on the best TMJ pillows that you can consider purchasing to help alleviate whatever discomfort you might be experiencing. But first off, let’s take a look at what bruxism and TMJ disorders are what their relation is to one another. The information here might be a lot to take and you might feel overwhelmed just like and my wife were when we first encountered these terms. We were basically on the threshold of a whole new world of ailments and had no inkling how harmful they were, what they meant, what caused them, and if they could lead to anything more serious. So let us give you some semblance of clarity right now. Keep in mind that the more you know about what you are facing, the easier it will be to find the appropriate solution when the time comes to go out and buy one. Click here to see what our picks are for best TMJ pillows! Do Pillows Really Work in Resolving TMJ Disorders? Bruxism is a condition wherein you grind, gnash or clench your teeth. If you have bruxism, you may involuntarily clench your teeth when you’re even awake (this is aptly called awake bruxism) or clench or grind them during sleep (sleep bruxism). Sleep bruxism is deemed a sleep-related movement disorder. People who clench or grind their teeth (brux) when they are asleep are at risk of having other sleep disorders like snoring and pauses in breathing — a condition called sleep apnea. Mild bruxism may not need any kind of treatment. However, there are some instances where bruxism is so frequent and severe enough that it can result in jaw disorders, headaches, damaged teeth and other health issues. Because you may have sleep bruxism and not know about it until complications foster, it’s crucial that you know the signs and symptoms of bruxism and to look for regular dental care from the professionals. Pay your dentist or doctor a visit if you are experiencing any of the symptoms listed above or have other issues regarding your teeth or jaw. Doctors and experts have yet to fully grasp what causes bruxism, but it may be because of a combination of physical, psychological and genetic issues. Awake bruxism may be caused by emotions such as anxiety, stress, anger, frustration or tension. At times, it may also be a coping mechanism or a habit formed during moments of intense concentration. Sleep bruxism may be a sleep-related chewing activity linked to arousals that occur during sleep. Stress — Raised levels of anxiety or stress, as well as anger and frustration can result in teeth grinding. Age — Bruxism is often seen in young children, but it goes away by the time adulthood is reached. Type of Personality — Having an aggressive, competitive or hyperactive personality, can increase your risk of bruxism. Medication — Bruxism may be an unusual side effect of some psychiatric medications, such as specific antidepressants. Tobacco, caffeinated drinks or alcohol, and recreational drugs may also elevate the risk of bruxism. It Runs in the Family — Sleep bruxism also occurs in families. If you have bruxism, other members of your family might also have the same condition or a history of it. Other disorders — Bruxism can be linked to some mental health and medical ailments like Parkinson’s disease, dementia, gastroesophageal reflux disorder (GERD), epilepsy, night terrors, sleep-related disorders such as sleep apnea, and attention-deficit/hyperactivity disorder (ADHD). Does Bruxism Cause Other Complications? Now that we’ve discussed the salient points of bruxism, let’s move on to talking about temporomandibular joint disorder or TMJ. Check out some of our recommended items to help you deal with TMJ disorder! The temporomandibular joint (TMJ) functions like a sliding hinge, connecting your jawbone to your skull. You have one joint on each side of your jaw. TMJ disorders — which is a kind of temporomandibular disorder or TMD — can lead to pain in your jaw joint and the muscles that control jaw movement. The precise cause of a person’s TMJ disorder is very hard to determine. Your pain may be because of a mixture of elements, such as genetics, arthritis or jaw injury. Some people who have jaw pain also tend to clench or grind their teeth (or bruxism as discussed in the section above), although many people regularly clench or grind their teeth and never experience TMJ disorders. Usually, the pain and discomfort linked with TMJ disorders is short-lived and can be alleviated with self-managed care or nonsurgical procedures. Surgery is considered to be a last resort after other more conservative measures have been tried and have not offered you any relief. TMJ disorders can also cause a clicking sound or grating sensation when you open your mouth or chew. But if there’s no pain or restriction of movement associated with your jaw clicking, you possibly don’t need TMJ disorder treatment. Seek medical attention if you the pain or tenderness in your jaw persists, or if you can’t even open or close your jaw completely. The temporomandibular joint combines a hinge action with sliding motions. The parts of the bones that interact in the joint are covered with cartilage and are divided by a small shock-absorbing disk, which usually keeps the movement smooth. What Are the Risk Factors Involved with TMJ Disorder? Is Bruxism Identical to Teeth Grinding and TMJ? Yes, bruxism is virtually the same as teeth grinding. However, let’s be clear that it is not the same as TMJ. To put it in simple terms, bruxism is just the act of involuntarily grinding your teeth during the night. It is however, a fact that the force of the bite that happens during this process is up to six times stronger than during the day, primarily because the jaw grits a lot harder when you are not aware of what you’re doing. If you didn’t know, the human jaw and teeth are strong enough to bite through bones and even some types of wood but that doesn’t happen simply because our brains prevent us from doing it (or risk damaging your teeth and gums). However, during the night, when you suffer from bruxism, you grind your teeth with a greater force than when you are awake. TMJ, otherwise known as Temporomandibular Joint Disorder is a serious medical condition that is seen through inflammations of the joints. Again, in simpler terms, if a patient suffers from bruxism, as mentioned above, he or she is not even aware of this because they don’t feel the effects of grinding their teeth through the night. But a patient suffering from TMJ will wake up with dire headaches and dizziness. In some cases, they will also feel various degrees of pain in their jaw, depending on how worse the inflammation is. Aside from that, they also complain of hearing popping sounds when they try to yawn or open their mouth wider than usual. Some have also said that the pain makes it really hard for them to chew their food. Some patients, in the most dire of cases, have even lost their hearing function. But worry not, there’s a solution so simple that we didn’t even believe at first when it was suggested to us by the doctor — pillows! Continue reading below to find out if using the right pillow works in alleviating pain associated with TMJ disorders. Click here to see what the best TMJ pillows are today! The idea that a pillow is a solution to your teeth grinding problem and even TMJ may seem unusual at first but research is coming up with irrefutable evidence that this is in fact, true and should be considered and tried. How it works has all has to do with the way you sleep, the position of your body and, of course, the kind of pillow you use. The first thing you need to know is that both bruxism and TMJ have a lot to do with the way you place your head and body while you get some zzzs. But take note that they are not caused by this. However, changing the way you sleep can help relieve the two syndromes and even correct them until they are eventually gone. The ideal thing to do is try to sleep on your back. If you are a side sleeper or worse, sleep on your face, all the tension accrued in your neck, shoulders, as well as the weight of your head will land on your jaw. This will place a lot of stress on it. If you grind your teeth, you can seriously damage your jaw if they are also under a lot of stress and weight. However, research has shown that you do not have any control over the position you sleep. This is where the best pillow for teeth grinders enter the equation. These pillows are usually contoured that won’t allow you to turn your head while you sleep. They also help in relaxing your neck muscles, relieving it of the strain. If you do sleep on your side and cannot modify this, use the same kind of contoured and specialized pillow but keep your normal pillow wedged between your arms. This will help your whole body loosen, removing the psychological need to grind your teeth. Check out some other useful products to help you with TMJ disorder! Most people have at least two or three pillows on our bed. Stuffed with feathers, down, or polyester, these pillows can either be a source of great relief or a source of discomfort. This is a prickly issue to tackle, as personal preference, sleeping position habits, and home environment are all crucial elements into the ideal pillow selection process. That said, here are a few tips to help you select the right TMJ pillow. First, if you have a pillow that you sleep well with, don’t change anything! But if you notice that you are always adjusting your pillow, or turning from one side to the other in search of a position that feels comfortable, you may want to consider looking for a brand new pillow. Perhaps you use a pillow with more cervical support, in which case it is of utmost importance to sleep on your back. If your pillow has a cervical bulge, and you end up sleeping on your side or front, the bulge can create pressure on the lower jaw, placing a load on your joint or messing with its alignment. You may find that placing pillows at your sides will deter turning to your side or stomach in your sleep. Ideal sleep position for your jaw is oftentimes on your back. However, some of us are just not made for sleeping that way. If you are a side or front sleeper, try and create a pillow setting where most of the support is felt on the fixed part of your skull (the head, ear, or cheek bone region), and not on your movable lower jaw. You may need some light support under your jaw to keep gravity from pulling down and displacing it. There is a tantalizing balance that can be obtained with attention to sleep ergonomics. At times, some support under the shoulder or chest can relieve pressure created on the jaw from sleeping on one’s stomach. In other cases, a comfortable pillow cannot be found for a straight horizontal sleep position, even when on our back. Some will do better with a significant or slight inclination in our reclining position. You may try a recliner or a bed with an adjustable angle. Here’s the practical side of all this: synthetic material pillows tend to be more durable and wash better, as well as being more hypoallergenic in material. But remember that you don’t always have to replace a pillow because it is uncomfortable. You can try modifying the pillow you own. For instance, if the pillow is too rigid, you can open a seam and take away some of the filler. Or if the pillow is too soft, you can condense the filling and pin together one end. Once you have found the right firmness in your pillow, sew up the modified edge and you are all set! Now let’s move on to the most crucial part of this article: our recommendations for the best TMJ pillows! Click here to see what our recommendations for best TMJ pillows are! 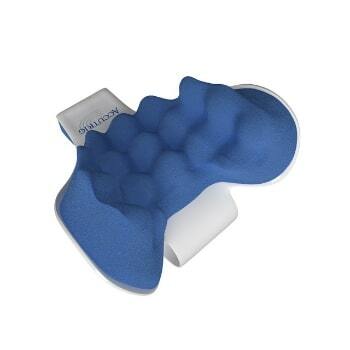 Flexibility is the Therapeutica Sleeping Pillow’s most enticing feature. 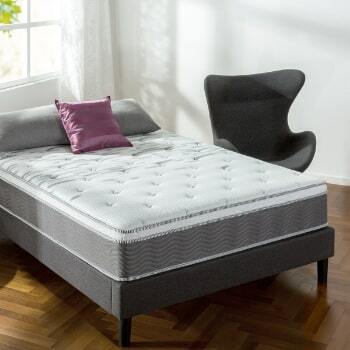 You get to choose from five sizes, and has an ergonomic design that basically ensures maximum comfort and support regardless how of the position that you sleep in. The Therapeutica Sleeping Pillow is composed of a firm, hypoallergenic and non-toxic foam, that will have you sleeping soundly every night and waking up without the pain and difficulty you usually get from bruxism and TMJ. 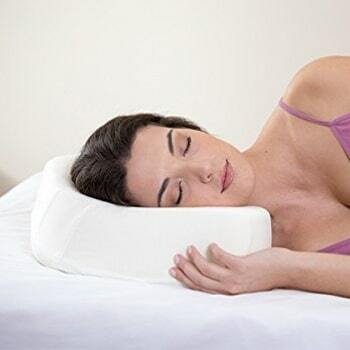 The EcoGreen Storage Chiropractic Pillow is the best budget TMJ pillow out on the market today. This pillow offers surefire relief for your bruxism and TMJ but also if you suffer from a herniated or compressed disc, headaches, a bad alignment of the spine, or pinched nerves. One more unique thing about it is that you only have to use it for 15 minutes each day to alleviate all of the symptoms mentioned above. Perhaps most importantly, it’s a great option if you’re on a budget, seeing as it costs a lot less than the other items on the list. 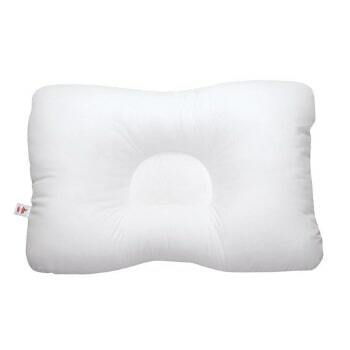 The LumaLife Luxe Low Profile Orthopedic Cervical Pillow is an orthopedic cervical pillow that does wonders when it comes to getting you the sleep that you crave and deserve. Composed of 100% latex foam, this pillow comes with a removable and zippered Tencel cover that will leave you sweat-free while you sleep. This pillow has a unique design that stimulates sleeping on your back, lessening the strain on your jaw and substantially reducing the chances of teeth grinding. Additionally, this ergonomic, contoured shape can eliminate wrinkles caused by sleep lines. This pillow’s loft, measured at 3 inches, is very comfortable to use. There are also a smaller and larger cervical support, so you can always get the right amount of support and alignment. You’ll even get inserts with your purchase that will allow you to customize the height of the pillow. 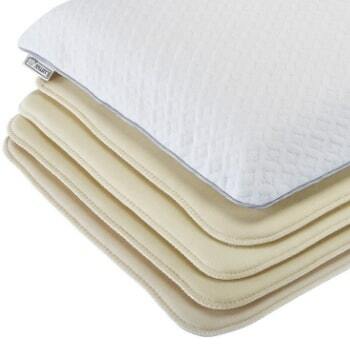 The Pure Comfort Side Sleeping Pillow has been particularly designed with side sleepers in mind. It features ear cutouts that will prevent ear pressure as you sleep. Better yet, this pillow diminishes overall facial pressure so it’s ideal for people who suffer from bruxism and TMJ. It comes with inserts, so you can modify it for optimal support. You can also use it since it is certified made for CertiPUR-US certified. This means that it’s free from any toxic chemicals that potentially can affect your health. If you have allergies, this pillow is a good choice too since it is hypoallergenic and its bamboo cover is resistant to dust mites. You might notice that this pillow does not explicitly say that it helps TMJ but users are recommending this cervical support pillow for the reason that it helps those that sleep on their stomach to transition into the right position to help alleviate TMJ symptoms. Let us be very clear: this “pillow” is more of a “floor exercise” device than a pillow. That is why this “pillow” is in this section as opposed to being in the section above, where the products are actual pillows. However, many people have seen great results with this. For those who are on a budget and looking for a cheaper alternative, this might be the device for you. If you’re like me and are skeptical of these kinds of inexpensive/cheap products that might be a money grab and never work, give this one a second thought. For those who have experienced physical therapy before: this is very similar to one of those devices that you use at home by just lying on the floor with your head in the device, to ease tension and/or stretch. I guess you can use this as a pillow on your bed if it is comfortable for you. Lie down (assuming a resting yoga position – palms up and legs and arms apart resting comfortably). Stay there for 15 minutes. Do this 2x a day, in the morning before work and at night before bed. Many people don’t realize how much of the TMJ strain is actually reallocated to your neck muscles. Some have reported that it feels similar to after receiving a professional massage. It has helped many sleep soundly at night, since people have not woken up with headaches, and there has not been any tightness in the morning. Reduced neck and shoulder tension, especially after sitting at a desk job all day in front of a computer screen. Magnesium helps relax your jaw muscles, and is very helpful for unwinding the TMJ clenching/clicking that you may experience. 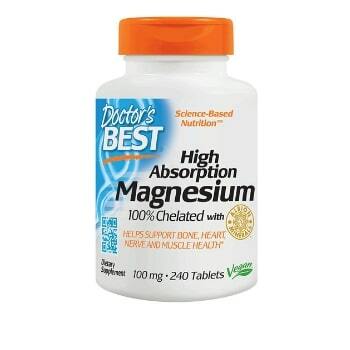 Magnesium serate is the safe, health beneficial choice. We recommend that you stay away from oral supplements that contain cheaper forms of magnesium (such as magnesium oxide), as they are predominantly used for laxative purposes. This is an extra firm mattress that may be able to keep your body and back straight. Sleeping on a firm mattress is crucial for those that have TMJ disorder because it allays pressure that a softer mattress would otherwise unnecessarily induce onto your jaw and head.